Step 1 Cook the onions in the butter in a large skillet over medium-low heat until browned, 15 to 20 minutes. Add the apples and cook until softened, 5 minutes. Deglaze the pan with the wine and Calvados or Brandy, scraping up any brown bits. Add the chicken and beef stocks, the water and the thyme; bring to a boil. Add the spice sachet and simmer on low heat for 30 minutes. Step 2 Add the apple concentrate and balsamic vinegar and season to taste with salt and pepper. Remove the sachet. Step 3To serve, divide the soup between two heavy, oven-proof soup crocks. Top each with croutons and a slice of cheese. Brown under the broiler a couple of minutes before serving. In Recipes-list.com we have selected the most viewed recipes from category - Main courses Soups . Enjoy the best recipes specially selected for you! 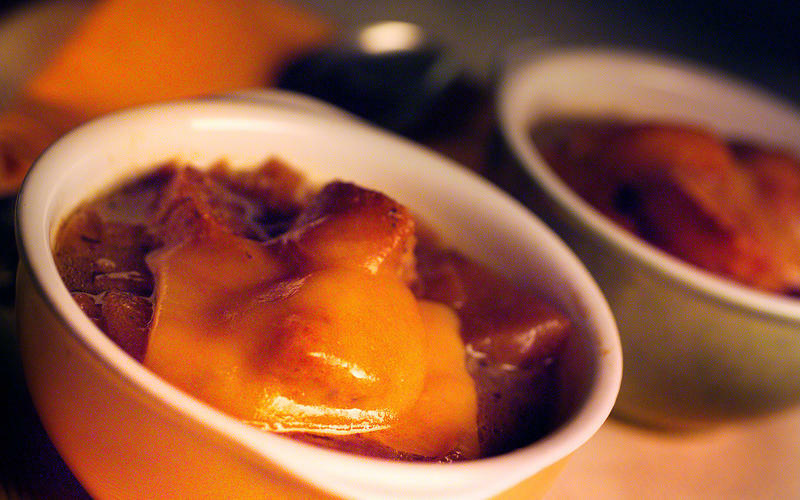 Baked onion and apple soup is the right choice that will satisfy all your claims.